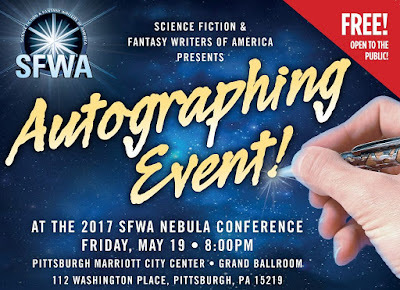 I'll be signing my books at the 2017 SFWA Nebula Mass Autographing on Friday, May 18 at 8:00 PM, alongside 100 other authors, including Phillippa Ballentine, Neil Clarke, Lawrence C. Connolly, Gardner Dozois, Scott Edelman, Timons Esaias, Laura Anne Gilman, Joe Haldeman, Larry Ivkovich, Mary Robinette Kowal, Rhonda Mason, Seanan McGuire, Jason Jack Miller, Connie WIllis, and Jane Yolen. The event is free and open to the public. For more information, visit the SFWA Nebula Conference website. WORKSHOP: Writing with Authority - How Does It Work?